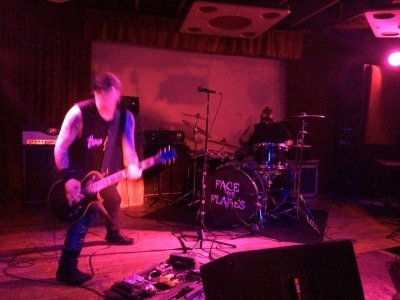 From Phoenix, Arizona, the guitar/drums duo of Face The Flames present an Electric Wizard-influenced heavy, sludgy, and fairly speedy riff-based Doom sound. Despite the somewhat limited instrumentation, they do a credible job of filling their soundstage with a mixture of hefty rhythms, largely clean vocals and some decent guitar leads. Interview with Face The Flames (2017-05-03).